Cracked Door Glass? No Problem! It can be very frustrating to see a crack in the glass on a door in your house. When you see it, you might have no idea how to fix it, or even worry that you’ll have to replace the door entirely. The truth is there’s no need to worry – Affordable Glass & Mirror Co offers door glass replacements that will get your glass looking like it did when you first bought the door. No matter the type of glass in your entryway, Affordable Glass & Mirror Co. has a solution. We offer 88 different glass styles that are bound to be the perfect replacement for your cracked glass door. For instance, anyone with a sliding glass door in their home knows they have to be careful with it. 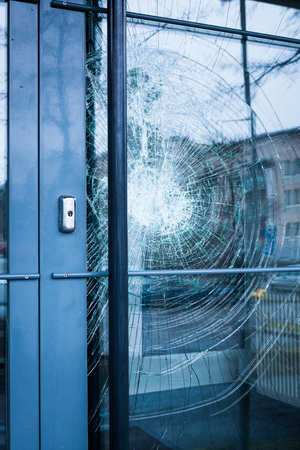 Closing your door too hard can damage the glass, and pushing up against it while coming or going can put pressure on the pane that leads to cracking. If your sliding glass door has cracked or broken, you’ll need a large pane to replace. It’s not a pain, though, when you work with Affordable Glass & Mirror Co. Our professionals can come out and replace the glass with no problems at all. The same can be said about smaller, more unique panes of glass, such as the ones on a door that only features a semi-circle of glass. If these smaller panes are cracked or damaged, you can have a new piece of glass custom designed and cut to replace it. We’ll measure the dimensions, even on custom doors, and create a replacement panel of glass to make your door whole again. Affordable Glass & Mirror Co. can also replace the glass in your door even if it isn’t cracked. Want to create a new look for your door or want to change out the pane in your door to something more opaque to offer more privacy? Let us measure and cut a new pane for you and give you the new style you’re looking for. For more information on our glass door replacement and installation services, call us today at 404-361-5151!